Minimum Wages Rising In 20 States And Several Cities The minimum wage will increase on or around January 1 in 20 states and 21 cities, impacting millions of American workers. Twenty-nine states will have set minimum wages above the federal level. 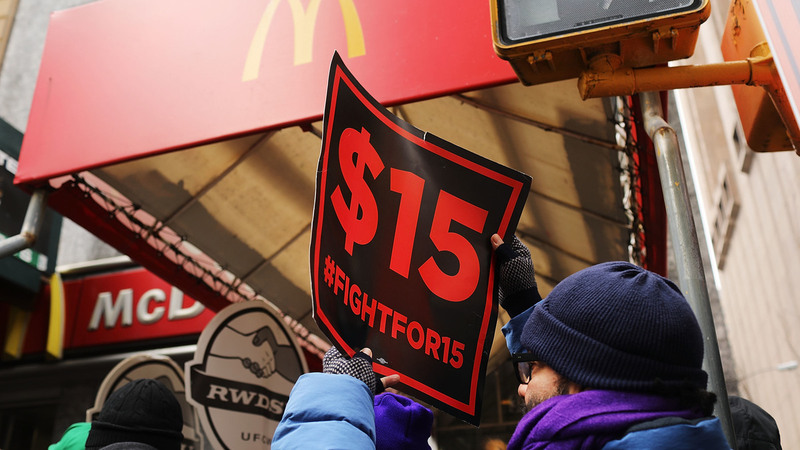 Protesters with NYC Fight for $15 gather in front of a McDonalds to rally against fast food executive Andrew Puzder, who was President Trump's nominee to lead the Labor Department on February 13, 2017 in New York City. Advocates say the trend toward higher minimum wages began in 2012, when the "Fight for $15" national movement began protesting for higher wages for fast food, child care and airline workers, among other businesses. While few have reached that threshold, several state legislatures and city councils have raised wages through phased-in laws, ballot initiatives and by adjusting for inflation. "It may not have motivated every lawmaker to agree that we should go to $15," David Cooper, senior economic analyst at the Economic Policy Institute, told the Associated Press. "But it's motivated many of them to accept that we need higher minimum wages than we currently have in much of the country." The Economic Policy Institute reports that in six states, the wage hikes are the result of new levels set by state legislatures. In California, Massachusetts and New York, the increases are small steps in the broader effort of eventually raising the minimum wage to $15 an hour. In another six states – Arizona, Arkansas, Colorado, Maine, Missouri and Washington – voters took matters into their own hands, approving measures at the ballot box to raise the minimum wage, according to the nonprofit. Increases in the remaining eight states reflect annual adjustments for inflation. Despite the national movement to raise wages for low-income workers, the state minimum wage is vastly different across the country. In Georgia and Wyoming, the minimum wage is lower than the federal level at $5.15 an hour, and five states do not require a minimum wage by law, according to the Department of Labor. Since the federal minimum wage was last raised in 2009, it has lost about 9.6 percent of its purchasing power to inflation, according to a 2017 report by the Pew Research Center. Up until a few decades ago, many economists worried that raising the minimum wage would lead to employers hiring fewer workers. Those ideas are changing, economist Arin Dube of the University of Massachusetts told NPR's Planet Money in November. "I think the weight of the evidence to date suggests the employment effects from minimum-wage increases in the U.S. have been pretty small, much smaller than the wage increases," he said. "For example, 30 years ago, most economists expressed confidence in surveys that minimum wages had a clear negative impact on jobs. That is no longer true today."